An American first edition of Hubbard's fourteenth novel, A Thirsty Evil, published by Atheneum in 1974 – the same year as the UK Macmillan first. 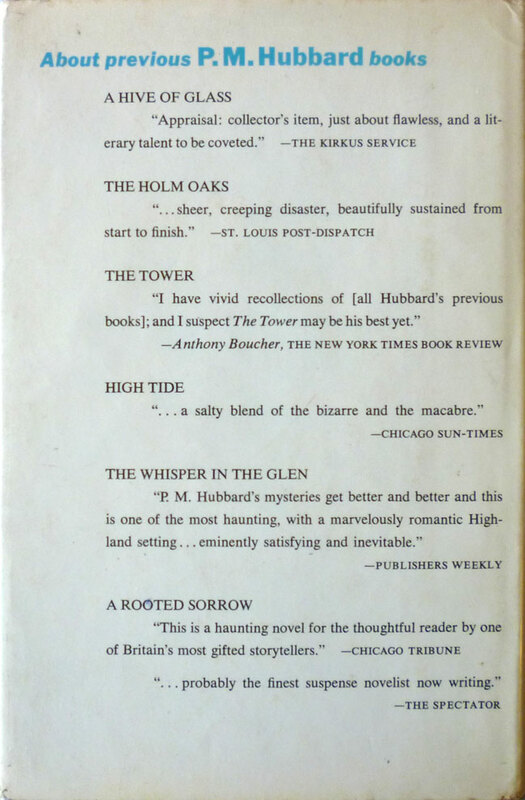 Once again the novel is set largely in the countryside, in this case the West Country, to where novelist Ian Mackellar decamps in obsessive pursuit of a woman, Julia Mellors, whom he met at a London literary party, leading him in turn to an eighteenth-century Folly Pool and to Julia's monstrous twin younger brother and sister. 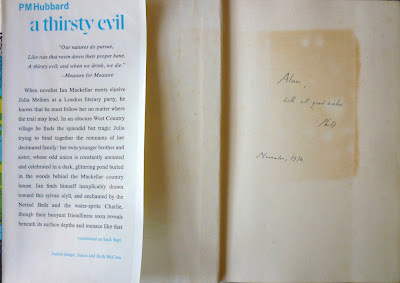 A Thirsty Evil was a particular favourite of the late H. R. F. Keating, who I blogged about just last week, and who said of Hubbard: "Acquire the Hubbard taste, it's richly rewarding". That remark was made to fellow crime writer Mike Ripley, who again has featured on Existential Ennui, this time in person – Mike left a comment on the second part of my Anthony Price interview back in August. 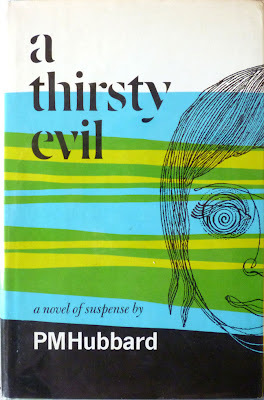 The dustjacket on the Atheneum edition of A Thirsty Evil was designed by James and Ruth McCrea, a husband-and-wife team of illustrators who together created a number of children's titles – among them The Magic Tree and The Story of Olaf – for Atheneum and other publishers in the '60s and '70s, not only illustrating the books but also writing them, setting the type, and pulling the proofs on their own hand presses. 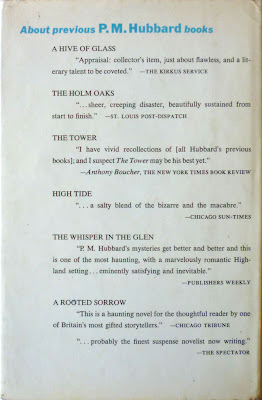 You're lucky to get a signed and dated copy from when it was published. On the flip side, I hate it when you go to a signing and the author makes a point of putting the date on the first editions of his earlier books you are handing him to sign. I'd rather have an unsigned first than a signed first with a date that indicates it was signed long after it was published. I always ask authors not to date a book and never to inscribe it (unless I am friends with the writer). Why do they think it's necessary to put a date next to their signature? Baffles me. And where is that darn ephemera? Ha, it's coming, honest. But it'll be tomorrow at this rate. Perversely – but probably unsurprisingly – I'm of the opposite opinion re dates on signatures, especially if signed in person. 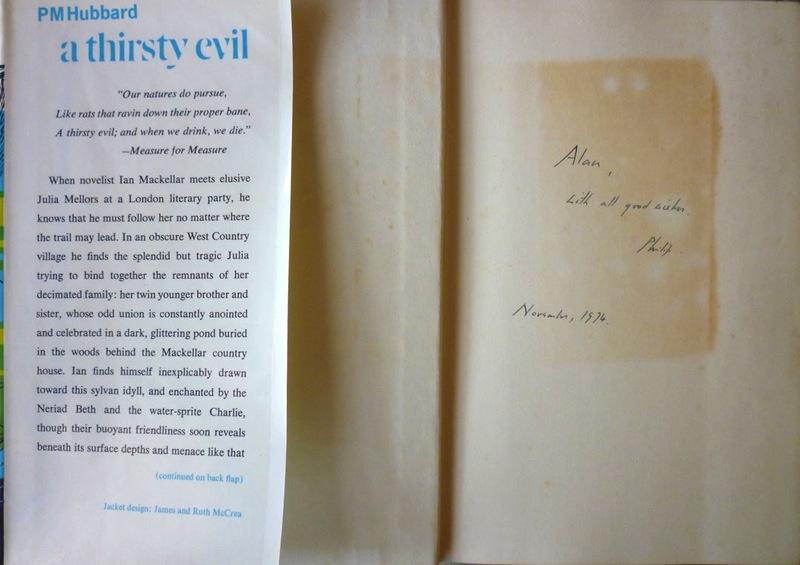 The editions Anthony Price signed for me are dated, which will always remind me of the day I met and interviewed him. 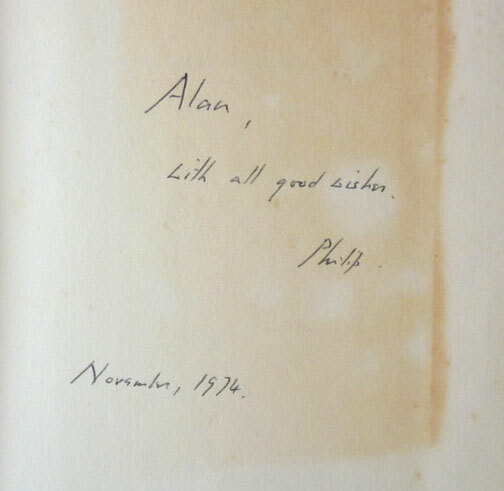 Contemporaneously signed books offer, for me, an added provenance, but even those signed years later I find interesting. And while a date on signatures like those obviously means a book couldn't have been signed on or near publication, does that really matter? Why would you want to rewrite history?